Earlier this year at her art class, Angel was tasked to do an artwork of her dream occupation and surprisingly to me, this was what she chose to draw and paint. Yes, a girly doctor complete with white coat, stethoscope, medical file and syringe. Cute, right? Like I mentioned before, this was but one of the various ambitions of hers at this young age and as the mum, I don't wish to discourage her from pursuing any of them. In fact, I think my part would be to impart to her more knowledge of each field so that as she grows, she can better decide on her dream job and discover her true passion. But, when it comes to general practitioners, physicians and surgeons, I have to confess I possess practically zilch knowledge. Therefore, I do find it an invaluable experience and would like to make the most of it when there are opportunities for the little ones to learn more about occupations in a hospital or even try being doctor for a day! 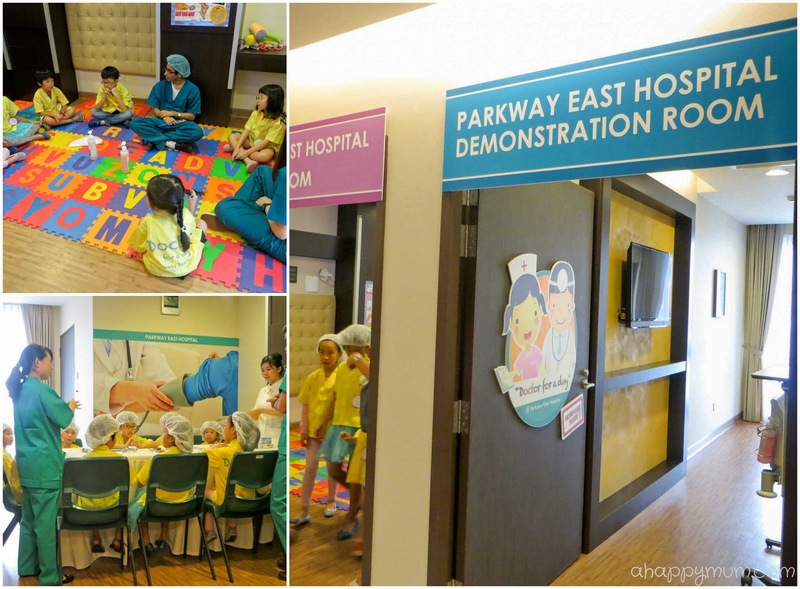 Today, I'm sharing with you about our experience at Health Detective Day and Doctor for a Day kindly organised by Parkway East Hospital. When I first received the invite to Health Detective Day, I was immediately intrigued as the event not only catered to the kids, it also had something planned for the grandparents as well! I thought it would be awesome if we could attend this 3-generation discovery experience and so I went around asking both my parents and in-laws to join in the fun. Well, it turned out that only my mum-in-law was able to make time for this event but we were still very excited to let her and Angel be health detectives for a day. 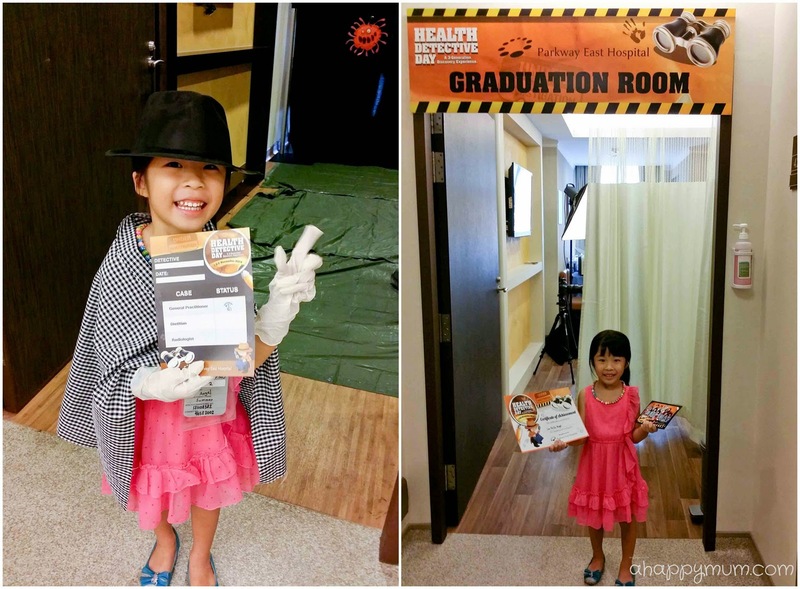 Once we were registered, Angel received this detective cape, hat and badge which psyched her up and made her feel like a very important person for the day. In that one-hour session, my mum-in-law got to learn about healthy eating where she categorised food items into a food pyramid and did muscle strengthening through various stretching exercises. Why, there was even a dance session where Angel and Ariel got to join in the fun. Like what the staff commented, my mum-in-law was really sporting, cooperative and she amazingly did every single one of the things that they asked her to do. So, kudos to her for trying so hard! get checked by the professionals. You know, my mum-in-law felt like a superstar that day because everywhere she went, there would be videographers and photographers at her heels, capturing her every move. Not to mention that we also obliged to participate in a live interview after the event. Well, you can also guess from this point that there were not many grandparents (actually, no one else) who participated in this event at our session. On the contrary, coming to the kids detective segment, every session (10 in a group) was full. I did hear that all the places were already snapped up way before the day of the event so you can tell how popular this is among fellow parents. 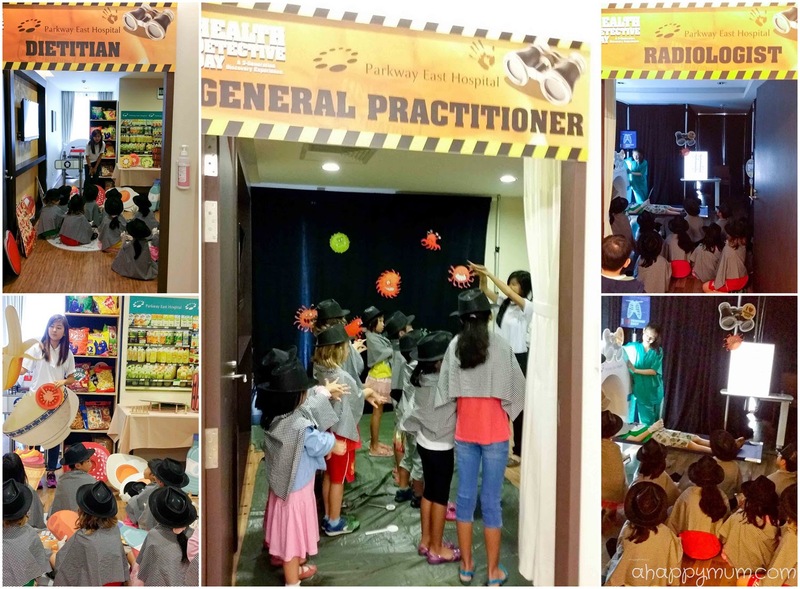 The kids were brought to different rooms where they were taught about the job scopes of a general practitioner, dietitian and radiologist. General Practitioner - The kids were taught and put into practice the eight steps of proper handwashing. Dietitian - They were tasked to choose food items for lunch and had the nutritional value of these items explained briefly to them. Radiologist - Simple terms regarding the MRI (or magnetic resonance imaging) were introduced. Since this was an event targeted at children aged 5-10, I thought some parts of it might be too hard for Angel to comprehend, for instance when it came to calories and magnetism. Still, it was a good introduction for her and most importantly, she was having fun while learning at the same time! At the end of the 60-min session, the kids got to take a group photo and each of them received a goodie bag and a certificate of achievement. I kind of think she looked reluctant when it was time to remove her cape and hat. 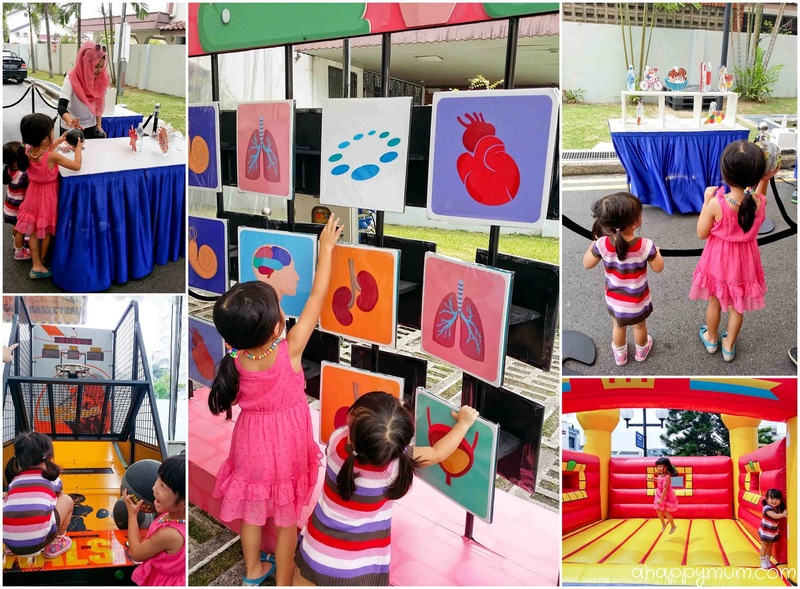 There were also carnival booths set up which allowed the kids to learn more about healthy lifestyles, germs and different anatomies through having fun at the games. Their favourite was - the bouncing castle, of course! There was also a Superchef challenge where families got to pit their cooking skills against each other. We would have loved to join but alas Angel was underage and so we had to miss it. 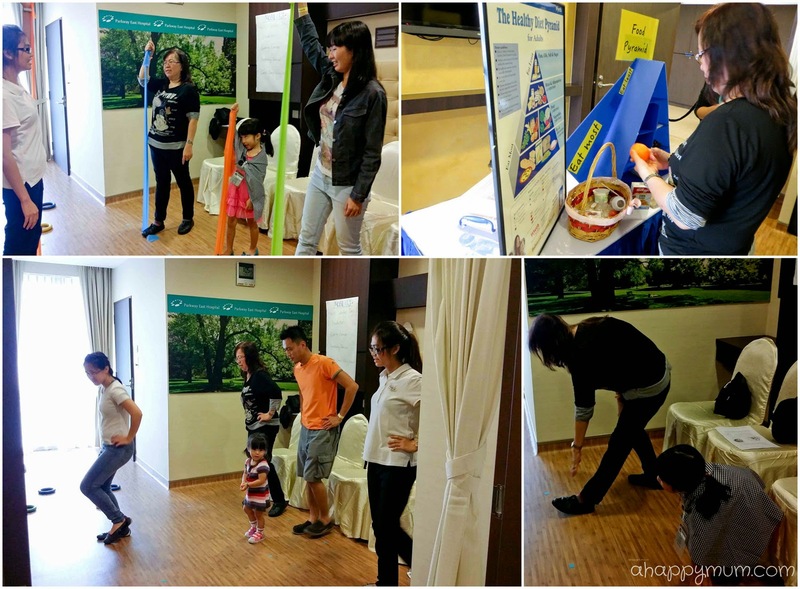 It was indeed a fun-filled Saturday for us and we are definitely looking forward to more 3-generation events in future! 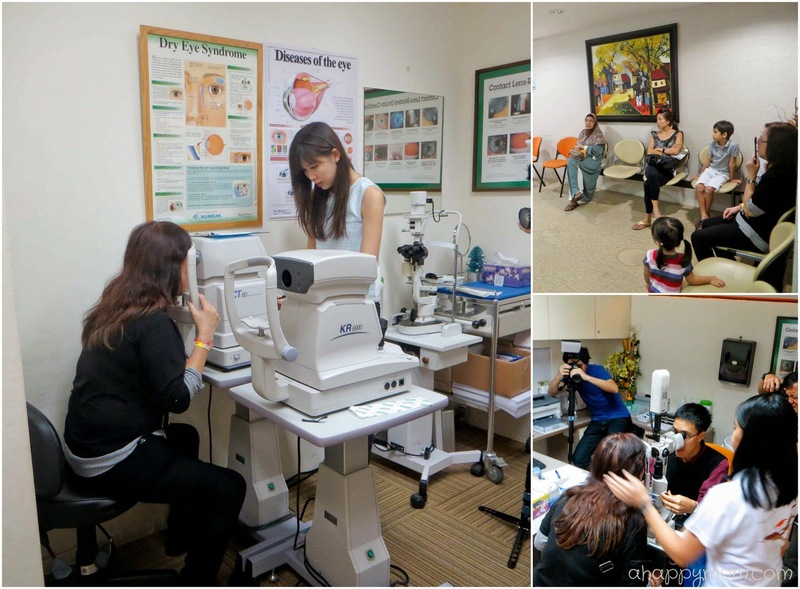 Previously, Angel also had the chance to take part in the Doctor for a Day event which had received overwhelming responses when it was held at both Mount Elizabeth Novena Hospital and Parkway East Hospital. It was an event we we were very much looking forward to after hearing all the favourable and positive feedback. Look! Somebody had on a scrub, gloves, mask and hairnet cap and simply couldn't wait to begin! As compared to Health Detective Day, this was a more in-depth learning experience which lasted 90 minutes and consisted of five different stations. Since parents were not allowed to stay beside their child and could only stand behind the line to watch at the entrance of each station, some kids might be a little shy if this was their first time here. I appreciated the fact that the staff took the time to warm up the kids while waiting for the others to arrive and would ask them casual questions to make them feel less out of place. General Practitioner - Stethoscopes and thermometers were handed out to the kids who learnt how to make use of these tools. Accident & Emergency - Fake blood was used and kids were taught how to properly bandage cuts and sprains on themselves. Nursing Room - This was Angel's favourite. The kids learnt to recognise the crying of a baby and were taught how to change diapers too. I even saw Angel rocking the baby to sleep (a fake one, of course)! Operating Room - The kids were told that a man was injured due to drunk driving and had to perform bone surgery on his elbow. Even though it was a mannequin, some kids were afraid and I was amazed that Angel was bold enough to take a step forward to screw on the nails. X-Ray Room - Basically, this was where the kids lined up to take a group photo. I have to say that this was such a fun and educational experience for Angel and definitely one of the most enriching events she had ever attended. She was most thrilled to be able to bring home a stethoscope in the goodie bag so that she could continue to hone her skills as a doctor! For me, I found that this was one of the best organised events so far and I was really glad we were able to have this golden opportunity. The workshop costs $25 per child and for every registration received as well as every teddy bear purchased, Parkway East Hospital will match with $300 to sponsor total knee replacement surgeries for the needy elderly. We might have received free media passes to the events but you know what, we bought a teddy bear on each of our visit just to show our support too. 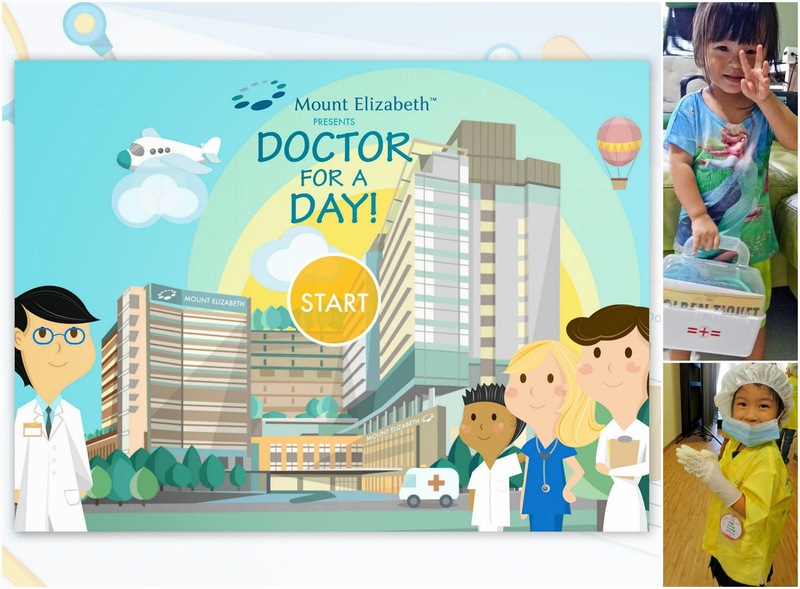 If you are interested in the Doctor for a Day event, you'll be thrilled to know that there will be one coming in December at Mount Elizabeth Novena! Do keep a lookout on their Facebook page and remember, you gotta be quick to secure a slot! 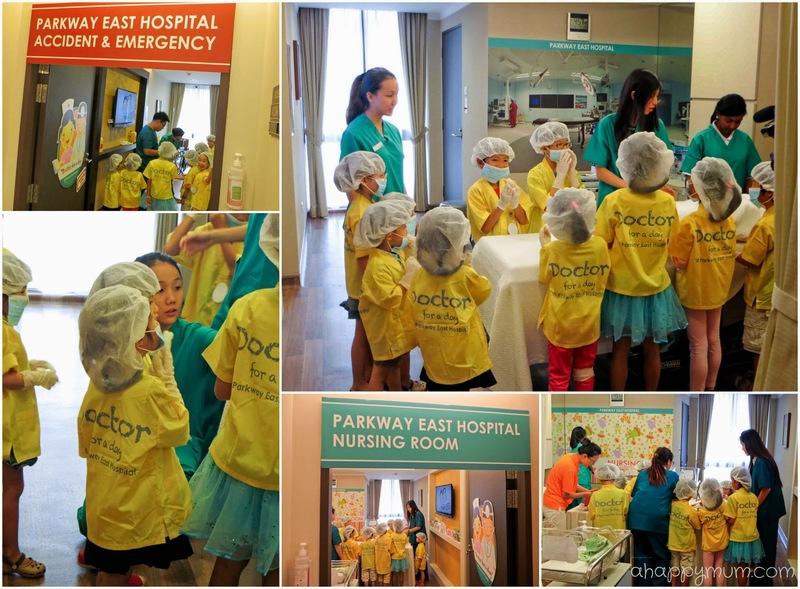 Thank you, Parkway East Hospital, for hosting us for these two awesome events and for letting my girl learn so much more about her dream occupation (at least, one of it)! Now, some of you might be keen to also know that the Doctor for a Day app can now be downloaded for free from iTune or Google Play Store here. 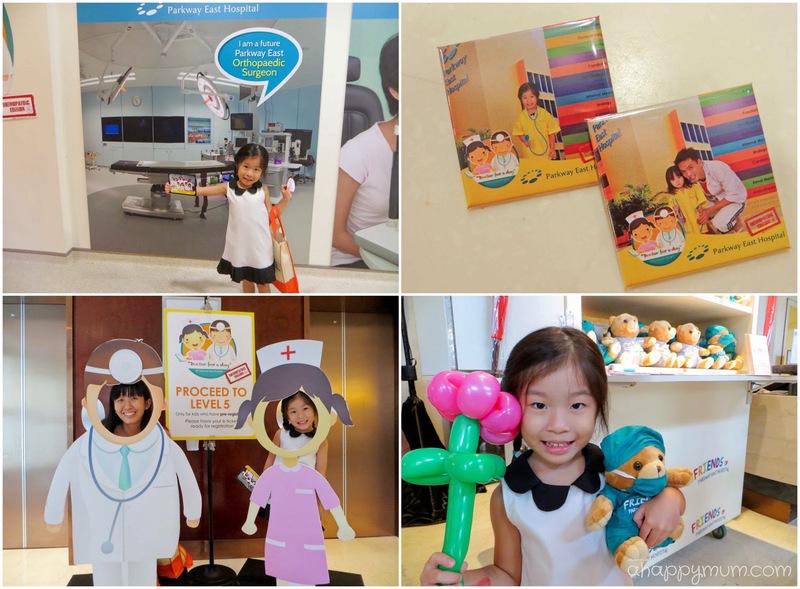 Suitable for kids aged 4-8 years old, this is the first of its kind edutainment application where your child can earn points, unlock achievement and exchange for doctors’ toys with absolutely no in-app purchases or pop-up advertisements. 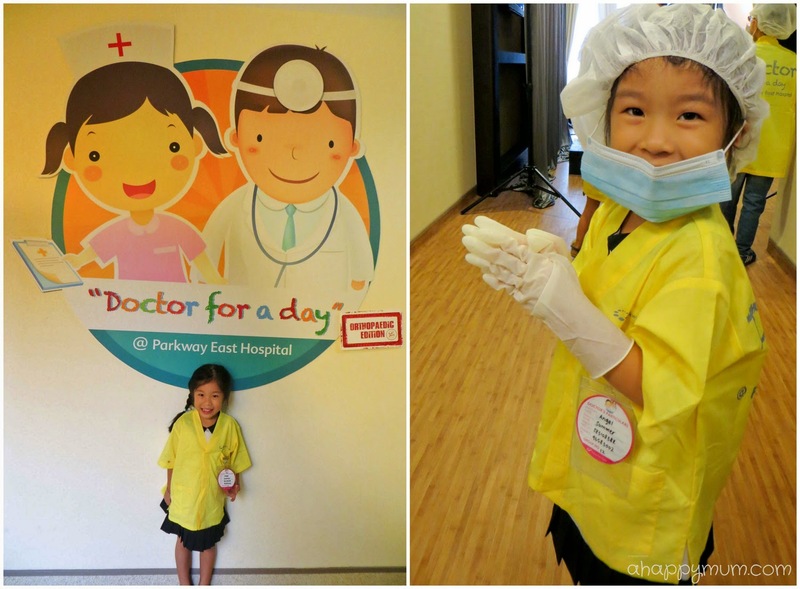 My Little Doctor - Get the chance to be creative and have fun by dressing up a doctor. Operating Theatre - Practise easy motor skills and learn more about operating theatre procedures using techniques like incise, inject and suture. Anatomy Memory - Stimulate young minds, practise visual memory and learn more about the different parts of the body. I'm not one for advocating electronic devices (no, we still don't own an iPad) and my kids play with my smartphone sparingly. Still, why not make the most of it and if they do end up playing on the phone or tablet, I would much prefer an educational one that engages, teaches and stimulates their minds. Have fun trying out the app too! Disclosure: We received media invites to Health Detective Day and Doctor for a Day organised by Parkway East Hospital. All opinions are our own. Yes it was an awesome event! I was impressed that they made it a 3-gen learning experience too! Thanks so much for the kind comment, Christina!